Rhetoric and Reality of Indian Foreign Policy under Modi: ‘Neighborhood First’? Modi led central government is approaching the end of its five-year term. At the time of its coming to power it had promised a significant change in India’s position in International politics. During elections campaign Narendra Modi gave the impression of a ‘tough’ leader who would keep “India First” and would never compromise on the issues of national significance‘unlike in the past’. The protection and promotion of ‘national interest’ was to be the sole motto of this government. After the election results were declared BJP got majority in the Lok Sabha making it the only party to do so in the last three decades. All these facts and declarations inflated the expectations of the analysts and common people from the government. In the initial months a kind of blitzkrieg of media campaigns helped in consolidating this image.Throughout his term Modi visited unprecedented number of countries (according to official data around 84 till 2018) apparently to pave the way for greater and meaningful engagements with them. Each time Modi visited a country Indian media went gaga about it selling the government version about its historicity and importance. On certain occasions such visits were prioritized even over critical moments at home. For example, immediately after announcing the demonetization Modi left for Japan in November 2016. However, despite all these hullabaloo and pomp the effects of all those visits on India’s status in international politics and in its economic development are invisible. However, most of the foreign policy commentators are yet not ready to call the bluff. Given the high expectations and high voltage campaign of a successful foreign policy carried out by this government it is pertinent to take a stock of the real situation now. In this context, present article is the first in the series of four articles attempting to analyze four different and defining aspects of India’s foreign policy-India and its Neighbors, India and China, India and the USA and Indiaand its anti-Imperialist Commitments-during Modi regime to put the record straight and clear. In this article we are going to examine India’s neighborhood policy. Given its geographical location and its historical links with the countries in South Asia India cannot afford them to be hostile. However, this common sense point has not been taken seriously by the Indian diplomats in the recent past. Despite the fact that post-colonial history of South Asia is full of mutual hostility and even wars there were always working links and diplomatic channels available for cooperation and peace among the countries. The story of the last four and half years is the story of withering away of that minimal confidence. Both in terms of state to state and people to people perceptions India’s relations with its neighbors have never been worse. SAARC was never a successful regional organization hence no one is shedding tears when it has not been able to hold its annual summits for last four years. But bilateral forums were always available to at least placate a delicate situation. In the last four years even that has dried down between the two most important countries of the region. For last couple of years all the channels of communication between Pakistan and India have been indefinitely suspended. Modi’s invitation to all the head of governments during his swearing in ceremony and his ‘surprise’ visit to Lahore in December 2015 also did not transform in any opening of a meaningful channel of communication. The inability of diplomats to resolve their mutual issues was quite visible in the Kulbhusan Jadhav case when India had to approach International Court of Justice for stopping Pakistan from executing Jadhav for the crimes of espionage. Modi government has refused to engage with Pakistan until it stops supporting the ‘terrorists’ in Kashmir. It has forcefully stopped all non-government track II diplomacy steps as well. Indian media has created a situation, apparently on the cues provided by the government and the Sangh Parivar where any talk of negotiations with Pakistan is seen and projected as an anti-India act. This ‘tough’ stand was supposed to be a diplomatic pressure tactics. Has it worked in softening Pakistan’s stands on any of the issues including Kashmir? Data shows that ‘infiltration’ of foreign ‘terrorists’ has increased and so has the violence in the Valley. The new government in Pakistan led by cricketer Imran Khan has made it clear that such tactics would not work. In diplomacy shutting out never works until the country under such ‘informal sanctions’ is heavily dependent either economically or politically. In the case of Pakistan neither is the case. In fact, whatever limited avenues available between both the countries before 2014 have been lost which has made Pakistan to rely even more closely on China. Though the author does not agree with the “zero-sum” understanding of Sino-Indian policies it was one of the objectives of Modi government to “counter” the so-called rise of Chinese in the region. In that limited context Pakistan’s reliance on Chinese can be seen as a failure of Indian diplomacy. On the other side of the border is Nepal with which India had relatively a closer and friendly relationship till recently. Unlike Pakistan Nepal is both economically and politically more dependent on India. However, it always maintained its independent using its geo-strategic location between India and China. Nepal has played it in its own advantage and that is the success of its foreign policy. Despite all the go between acts of Nepal from time to time no regime there has ever been so explicit in expressing its‘unhappiness’ to Indian maneuverings in the country’s affairs. The post-revolutionary regime in Nepal took a long time to come up with its constitution. When it finally did people of Madhesi ethnic group felt neglected and took their demands to the streets. Nepal sensed the involvement of India into the unrest leading to diplomatic tensions in 2015-16. The result was a deep sense of distrust despite successive visits of Prime Minister Modi. The current Nepalese government has been quite explicit in its policies towards India on several fronts and has preferred Chinese. Modi’s three visits in the last four years ended up like a pilgrimage to Hindu temples in front of the Indian Media. This was obviously for the consumption of constituencies back home. The left leaning government in Nepal sees India as a pro-monarchy hegemonic power in the region and does not see any motivation to re-energize the relations despite the fact that its economy is heavily dependent on India. This shows the failure of the Modi regime to build that confidence. Bangladesh was the only country in the region defying the trend described above. Modi visited the country twice and on both the occasions he got better responses in terms of public pronouncements by the Sheikh Hasina government. The trade between both the countries is flourishing. However, if we look more carefully it is obvious that the picture is not that bright. There are several contentious issues between both the countries and almost all of them are products of Modi government’s enthusiasm in pursuing a culturally regressive and communal policy at home. The issue of Rohingyas is one major economic burden on a poor country like Bangladesh. India’s reluctance to allow Rohingyas to seek shelter left Bangladesh alone to provide for their survival. Modi regime’s refusal to allow Rohingya’s refuge was based on its perceived ‘security implications’ and economic burden. However, in all the non-official pronouncements current dispersions’ Islamophobia was quite explicit. Bangladesh would have appreciated any sharing of economic burden and it would have opened up further avenues for greater cooperation in future. The refusal of Modi government to give shelter to Rohingyas was not only a failure of its foreign policy it was also a betrayal of its anti-colonial legacy. Apart from Rohingyas Modi government’s insistence on ‘throwing out’ the ‘Bangladeshis’ from India’s North-East through a massive exercise of “National Register of Citizenship” is yet another possible point of clash between both the countries. The recent “Citizenship Bill” which promises to give Indian citizenship to ‘prosecuted minorities’ from all the neighboring countries including Bangladesh is yet another unnecessary provocation. It assumes that Hindus are prosecuted in Bangladesh and the state there is not able to provide enough security to its own minority population. Except for the exchange of “enclaves” in 2015 which was negotiated by the previous government Modi regime’s policy to Bangladesh has nothing to show as an achievement. Modi government’s failures in Sri Lanka and Maldives are more pronounced. Both the countries had a vibrant trade and political links with India and were seen crucial partners in building a peaceful and prosperous South Asia. However, in the last four years these countries have moved closer to China due to greater economic advantages they can derive from that country. It still should not be seen as a zero-sum scenario; China’s gain is India’s loss. However, given the inability of India to match advantages presented by Chinese should make Indian policy makers to rethink about their strategy in the region. Though the increasing presence of Chinese in the Indian Ocean region will be seen as failure of foreign policy in the security related discourses of international relations the real failure lies in the inability of India to provide necessary economic support these countries require. 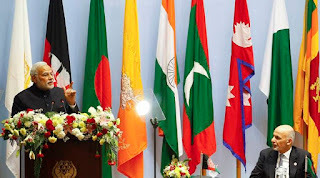 The failure of SAARC is not limited to the inability of its members to meet. The regional trade agreement seen as a great step in regional economic prosperity almost a decade ago is still incomplete. If we take the volume of trade among the members of the SAARC it is not growing as fast as it could, given its potential. The obvious apathy towards reviving SAARC is quite visible among the Indian establishment. Since it is the biggest country in terms of both population and economy in the region the greater responsibility for the failure of SAARC lies with India. Afghanistan is another major country with which the relationships have stagnated if not deteriorated in the last four years. The current government has no fresh initiatives for Afghanistan and it is reluctant to increase the volume of its investment. The India-Afghanistan relations have become a low-key affair now from its heydays a decade ago. In conclusion one must admit that Indian foreign policy towards its neighbors was never perfect. Given its size and economic might other countries have always suspected it to have hegemonic, big brotherly attitude which created mistrust. Indian policy makers did not try to address these apprehensions even when they were the votaries of “Non-alignment” and third world solidarity. However, given the hyper-nationalist and hawkish nature of current dispensation it is commonsense that they would do anything to alleviate such apprehensions now. The boasting about surgical strikes and preferring show of strength over diplomacy, shutting down of borders to poor immigrants looking for means of economic survival from the neighboring countries and political and cultural bonhomie with the conservative and regressive forces when people are fighting for more democratic and progressive regimes in their countries can only heighten such doubts about the intentions of Indian foreign policy among its neighbors no matter how attractive the phrasing of it is. Modi government’s foreign policy towards its neighbors is a victim of the ideology of its constituent social class who refuses to see the neighbors as equal, independent states.